Summer may be winding down, but it's never too early to start looking forward to next summer's pool parties. And if you're looking for some inspiration for your own backyard paradise, then you've come to the right place. With breathtaking views, charming landscaping and exquisite architecture, these luxury pools will make you want to dive on in. This back yard is sleek and modern. But, the little touches, like the string lights and teak wood furniture, give it a hint of Southern charm. What makes this pool so unique is that it seamlessly fuses with the garden and other natural elements, like the shrubs and stonework. The blue opaline water in this pool makes this patio cozy and cool. The neutral tones of the space and the slightly unkempt greenery create a laid-back atmosphere - perfect for your next pool party! This pool, shaped like a Les Paul, is sure to be a hit with any guitarist. The bold and creative design is both fun and functional. This pool synergizes with the natural elements found in the homeowners' outdoor space. With a dock right next to the log house, you can go straight from the living room and dive into the pool. The pool also spills over a rocky waterfall at the edge. The fireplace and stone elements of this pool make it a space that easily transitions from a day at the pool to an afternoon bonfire. You don't have to have a perfectly flat backyard in order to enjoy the luxury of a pool on your property. This stone-trimmed infinity pool will showcase the scenic views surrounding your home. This multi-tier waterfall and the rustic hot tub make for a stylish and homey space. This down-to-earth design incorporates elements of nature with an infinity pool. And just look at that view. 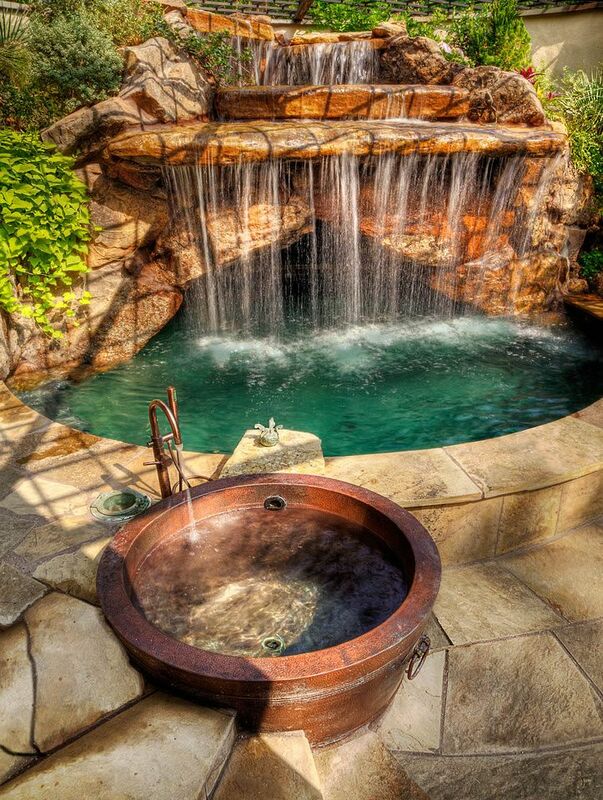 Waterfall, slide and hot tub - oh my! This pool has all of the add-on features you could ever dream of. This may look like a pond, but it's actually a pool. With natural features, like lily pads and overgrown grass, this pool would be a great addition to your cabin in the woods. With this patio, it's almost like having a five-star resort right outside your backdoor. From the stone fireplace to the hot tub and plenty of seating for your guests, this pool pulls out all the stops.